The Conference fixtures have been released for the new season with FC Halifax Town facing a long trip to the capital on the opening weekend. Halifax made a bid for the Conference play-offs in each of their last two seasons, finishing ninth in the table last year. The Shaymen start the new campaign away to Boreham Wood on August 8 and face a tough opening month with fixtures against Chester, Torquay United, Tranmere Rovers and Wrexham also scheduled. Chester are the first visitors to the Shay on Tuesday, August 11, while Torquay come to Town four days later. September begins with a tricky trip to Aldershot Town while the first West Yorkshire derby with newly-promoted Guiseley is on Tuesday, September 15, at Nethermoor. Boxing Day takes Neil Aspin’s side to Lincoln City, before the retusn fixture seven days later at the Shay on Saturday, January 2. 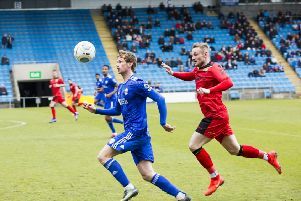 Neil Aspin’s side round off their season with a home clash against Macclesfield Town on April 30.